It pointed to the Nevada County Arts Council and cities “working as one,” adding that the designation officially makes the County “a destination for the arts.” The honor from the California Arts Council coincides with the opening of California WorldFest in Grass Valley on Thursday, one of the state’s most celebrated festivals. The joint statement also cited Sierra FoodWineArt magazine for the “rich resource of narrative” and “profound knowledge” that it contributed to the highly competitive application. The California Arts Council on Monday selected Grass Valley-Nevada City and Truckee as two of California’s state-designated cultural districts. Grass Valley-Nevada City and Truckee Cultural Districts are both situated within Nevada County and join 12 other districts that will launch the innovative new program highlighting thriving cultural diversity and unique artistic identities within California. The Truckee Cultural District is the result of a partnership between the Town of Truckee, Truckee Public Arts Commission, and Truckee Chamber of Commerce, with support from Truckee Arts Alliance and NCArts. “Recognition of our unique arts and culture as a small mountain town and as an important thread in the fabric of our state’s culture, is not only commendable but so very exciting,” says Robie Litchfield, co-chair of Truckee Public Arts Commission and co-founder of Truckee Arts Alliance. Grass Valley-Nevada City Cultural District’s designation is the result of unique twin-city application and, together with Truckee Cultural District, they represent two of only four rural Cultural Districts statewide. Grass Valley-Nevada City Cultural District can be found deep within California’s Gold Country, where the historic twin cities of Grass Valley and Nevada City merge in the Sierra Foothills amidst pristine rivers and picturesque forests. Home to the Nisenan, the area’s oldest indigenous peoples, the district is rich in cultural histories and the arts, and has an exciting emerging wine culture. Grass Valley-Nevada City Cultural District and Truckee Cultural District will receive the designation for a period of five years, per state legislation. Designation, under this pilot launch of the program, includes benefits such as technical assistance, peer-to-peer exchanges, and branding materials and promotional strategy. 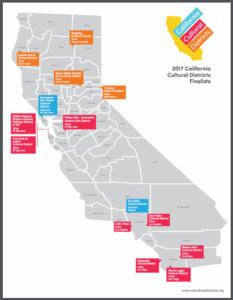 The California Arts Council has partnered with Visit California and CalTrans for strategic statewide marketing and resource support. Members of the California Arts Council include Chair Donn K. Harris, Vice Chair Nashormeh Lindo, Larry Baza, Phoebe Beasley, Christopher Coppola, Juan Devis, Kathleen Gallegos, Jaime Galli, Louise McGuinness, Steven Oliver, and Rosalind Wyman. For more information, visit www.arts.ca.gov.